I’ve visited Pushkar many times, but my favorite time to visit is during the Pushkar Camel Fair! It’s a well known event that comes once a year to Pushkar, usually during the end of October to the beginning of November (in 2014 it will be running 26 October to 6 November). Tons of people from all over the world descend on the otherwise sleepy city of Pushkar for a huge multi-day long event that includes the sale of horses, mules, donkeys and of course, camels as well as tons of local dance shows, religious speakers and all other manner of events. Other than the camel fair, Pushkar is known for being one of the holiest cities in India for Hindus. It is said that the tears of Lord Shiva, when weeping for the death of his wife Sati, formed the lake in Pushkar, which is a central feature of the city. Pushkar is one of the oldest cities in India and also houses one of the only temples in the world dedicated to Lord Brahma, located here because Brahma is said to have formed the holy city of Pushkar himself. Because of these holy associations, eating meat and drinking alcohol and smoking is forbidden within city limits, although this is a commonly broken law behind closed doors. 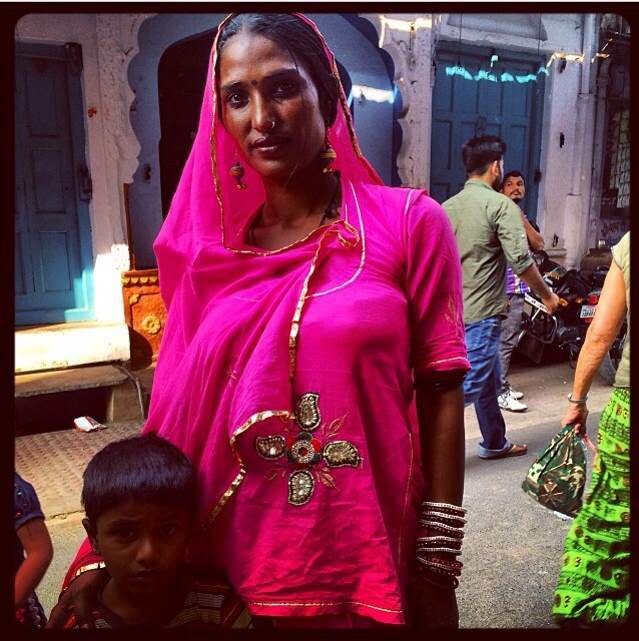 A woman who asked for her photo to be taken on the streets of Pushkar. Pushkar is also a hippie backpacker hot spot, and there are tons of Israeli backpackers who come here to stay in the multiple ashrams in the area, as well as other hippie types from America, Australia, and other parts of the world. There are many hashish and opium smokers in the area too, as a response to the hippie backpackers who frequent the area. There are too, many Hindu pilgrims from other parts of India, as Pushkar is one of the five sacred dhams (pilgrimage sites) for devout Hindus the world over. I have a friend who owns a hotel here in Pushkar, the New Paradise Inn, and whenever I visit Pushkar, I stay that this hotel, which is a very basic backpacker’s spot, but is safe, clean and definitely the place to party if you find yourself in Pushkar. Just tell the cook not to use too much oil in his food! 😉 Also, don’t stay downstairs because there is a ghost which haunts the downstairs rooms. If you’re lucky and you take your food out on the patio on the roof, you’ll probably run into the resident monkeys as well, who love to run up and down on the roof and sneak looks down at you while you eat. There are many things to do in Pushkar, from camel safaris into the surrounding desert, to hiking the nearby Nag Parbat or “Snake Mountain”. In addition, the best curio store in all of Rajasthan lies in the Pushkar market, just past the local Brahma temple. If you walk down the main road in front of the temple past the main square where you find produce sellers, and continue maybe 300 meters, on the right hand side, right next to a cart full of powdered colored chalk, there will be a store which sells curios of all kind from all over Rajasthan, in addition to amazing historical art pieces and carvings from old temples. The owner of the store, Krishna, generally closes the store during the Pushkar Camel Fair because the crowds get too crazy, but if you go at any other time of the year, you’ll find him tending his store, full of awesome antiques that he buys from estate sales in Rajasthan and collects from local artists, merchants and art dealers. If you have any problem finding him, just ask around the market for Krishna’s antique store, and everyone will know who you’re talking about and lead you in the right direction. Another fun place to visit in the market is a store called Roots of Pushkar, which sells local music CDs and records, along with all other types of music, from American pop music to the latest Bollywood hits. Roots of Pushkar also sells movies and books as well. They have a collection of recordings of traditional gypsy music from Rajasthan, performed in the traditional way, that’s well worth purchasing because it’s beautiful music and also because proceeds go to a fund created to help support and sustain the local music of the region. Lastly, no trip to Pushkar is complete without visiting the ghats, or steps, leading down to the famous Pushkar Lake. It’s said that a dip in this lake is akin to a spiritual cleansing and revival, and even if you are not Hindu and even if you are not at all spiritual, the experience of descending the ghat and taking a dip in the lake is one you cannot miss. I can vouch for the benefits of doing so, as each and every time I’ve had a dip in Lake Pushkar, I’ve had something wonderful and miraculous happen to me. Perhaps it’s simply because I believe so strongly in the benefits of the cleansing or perhaps there is some spiritual aspect at work, but I will wholeheartedly say that a dip in the lake will bring you luck. 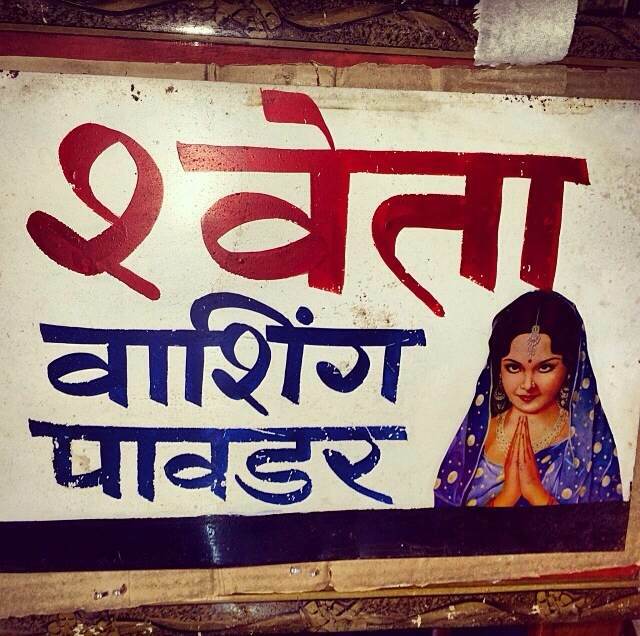 A tin advert from the curio store in the Pushkar market. I was once stuck in Pushkar, about to run out of an important medicine I take for a health problem I have. I had spent days wandering around to all the pharmacies in Pushkar, unable to find the medicine I needed. I was distraught, as I was not ready to leave India yet, but facing that prospect if I could not find more medicine. I was about to give up, walking through the markets of Pushkar, about to give up the quest to find this medicine, when a small child approached me near the ghats with a bougainvillea flower and asked if I’d like to take a dip in the lake. I said yes, and did so, praying in my head very hard, asking the gods to show me the way that I could stay in India, the way to find more medicine. Well, as soon as I finished my dip, and walked back up the ghat, at the top I was met by an old man who asked me “What are you seeking? I can tell you want something…”. I told him my situation and the medicine that I needed, and he just smiled, turned, and told me to follow him. I did. Low and behold, not more than 100 meters from the entrance to the ghat, was the one pharmacy in Pushkar I had not seen or visited. They had a full month’s supply of the medicine I needed to stay in India. I bought the entire supply for about 50 USD (it would have cost me well over 100 USD in America), and I was able to extend my stay in India for another month! So I believe in the divinity of Lake Pushkar. This is just one of many stories of this magical city! If you’re in India, and especially if you’re visiting Rajasthan, no trip is complete without a stop in Pushkar and a dip in the lucky lake! Accommodation: New Paradise Inn, $15 night/per room. Within walking distance of the Brahma temple, market and lake. Pushkar Curio Store: +91 98-28-477812, owner Krishna. EDIT: I seem to get a lot of traffic to this page from Google searches relating to opium in Pushkar. In general, in the smaller towns and back areas of Rajasthan, it’s not that difficult to find. Oftentimes, there will be little opium shacks alongside the road, with local people sitting and just chewing or smoking opium. These are on the small roads outside of the main cities (i.e. you won’t find them between say Jaipur or Jodhpur, but in places like say Phalodi, or Jaisalmer). Also, as a foreigner, unless you’re with locals, you won’t be alerted to what’s happening, or likely offered any, and if you go asking, no one will tell you what’s going on. Opium is still illegal and while it’s part of the culture in Rajasthan and has been for a long time, and most cops overlook it for local people, as a Westerner, you will not be trusted to handle yourself or the situation. My best advice if you’re LOOKING for opium is to befriend someone local and put the time and effort into getting to know them, and then, when the time is right, ask them for a connection. Trust me, there are plenty of drugs in Pushkar (I’ve seen for sure cocaine, opium, H, meth, and hash) but you won’t be able to just roll on up as a Western tourist and think you can just walk into an opium den. It’s not like that. As with most 3rd world countries, it’s all about who you know, not how much money you have. Bribing people to take you to these places will just result in failure. Also, if you’re into opium, also try Kathmandu–there are tons of opium dens there as well, and again, befriend locals, although in Kathmandu it’s easier to find them than in India. Lastly, don’t think you’re going to walk into some 18th century romantic vision of what you think of as an “opium den”; it’s 2014 and opium dens like that don’t exist anymore, sorry. When I say opium den I mean a place where people take opium. Usually it’s a roadside basic shack with a tarp for a roof and a dirt floor or a dirty, crowded back room in a building with no windows, florescent lights, and a bunch of dirty mattresses on the floor. Be forewarned! Don’t go for the ambiance, basically, go because you love opiates.